Rhythmic, oscillating motions of the eyes are called nystagmus. The to-and-fro motion is generally involuntary. Vertical nystagmus occurs much less frequently than horizontal nystagmus and is often, but not necessarily, a sign of serious brain damage. Nystagmus can be a normal physiological response or a result of a pathologic problem. The eyes play a critical role in maintaining balance. They are directly connected to other organs of equilibrium, most important of which is the inner ear. Paired structures called the semicircular canals deep in the skull behind the ears sense motion and relay that information to balance control centers in the brain. The eyes send visual information to the same centers. A third set of sensors consists of nerve endings all over the body, particularly in joints, that detect position. All this information is integrated to allow the body to navigate in space and gravity. It is possible to fool this system or to overload it with information so that it malfunctions. A spinning ride at the amusement park is a good way to overload it with information. The system has adapted to the spinning, expects it to go on forever, and carries that momentum for some time after it is over. Nystagmus is the lingering adjustment of the eyes to tracking the world as it revolves around them. Nystagmus can be classified depending upon the type of motion of the eyes. In pendular nystagmus the speed of motion of the eyes is the same in both directions. In jerk nystagmus there is a slow and fast phase. The eyes move slowly in one direction and then seem to jerk back in the other direction. Nystagmus can be present at birth (congenital) or acquired later on in life. A certain type of acquired nystagmus, called spasmus nutans, includes a head tilt and head bobbing and generally occurs between four to 12 months of age. It may last a few months to a few years, but generally goes away by itself. Railway nystagmus is a physiological type of nystagmus. It happens when someone is on a moving train (thus the term railway) and is watching a stationary object which appears to be going by. The eyes slowly follow the object and then quickly jerk back to start over. Railway nystagmus (also called optokinetic nystagmus) is a type of jerk nystagmus. This phenomenon can be used to check vision in infants. Nystagmus can also be induced by fooling the semicircular canals. Caloric stimulation refers to a medical method of testing their connections to the brain, and therefore to the eyes. Cold or warm water flushed into the ear canal will generate motion signals from the inner ear. The eyes will respond to this signal with nystagmus if the pathways are intact. Albinism. This condition is caused by a decrease in pigmentation and may affect the eyes. Disorders of the eyes. This may include optic atrophy, color blindness, very high nearsightedness (myopia) or severe astigmatism, or opacities in the structures of the eyes. Acute labyrinthitis. This is an inflammation in the inner ear. The patient may have dizziness (vertigo), nausea and vomiting, and nystagmus. Brain lesions. Disease in many parts of the brain can result in nystagmus. Alcohol and drugs. Alcohol and some medications (e.g., anti-epilepsy medications) can induce or exaggerate nystagmus. Multiple sclerosis. A disease of the central nervous system. Nystagmus is a sign, not a disease. If abnormal, it indicates a problem in one of the systems controlling it. An ophthalmologist and/or neuro-ophthalmologist should be consulted. There is one kind of nystagmus that seems to occur harmlessly by itself. The condition, benign positional vertigo, produces vertigo and nystagmus when the head is moved in certain directions. It can arise spontaneously or after a concussion. Motion sickness medicines sometimes help. But the reaction will dissipate if continuously evoked. Each morning a patient is asked to produce the symptom by moving his or her head around until it no longer happens. This prevents it from returning for several hours or the entire day. Prisms, contact lenses, eyeglasses, or eye muscle surgery are some possible treatments. These therapies may reduce the nystagmus but may not alleviate it. Again, because nystagmus may be a symptom, it is important to determine the cause. Involuntary rhythmic oscillation of the eyeballs, either pendular or with a slow and fast component. caloric nystagmus rotatory nystagmus induced by irrigating the ears with warm or cold water or air; see caloric test, under test. Cheyne's nystagmus , Cheyne-Stokes nystagmus a peculiar rhythmical eye movement. end-position nystagmus that occurring in normal individuals only at extremes of gaze. gaze paretic nystagmus a form of gaze nystagmus seen in patients recovering from central nervous system lesions; the eyes fail to stay fixed to the affected side with a cerebral or pontine lesion. opticokinetic nystagmus , optokinetic nystagmus the normal nystagmus occurring when looking at objects passing across the field of vision, as in viewing from a moving vehicle. pendular nystagmus that which consists of to-and-fro movements of equal velocity. retraction nystagmus , nystagmus retracto´rius a spasmodic backward movement of the eyeball occurring on attempts to move the eye; a sign of midbrain disease. rotatory nystagmus involuntary rotation of eyes about the visual axis. vestibular nystagmus that due to disturbance of the vestibular system; eye movements are rhythmic, with slow and fast components. A rapid, involuntary, oscillatory motion of the eyeball. involuntary, rhythmic movements of the eyes. The oscillations may be horizontal, vertical, rotary, or mixed. 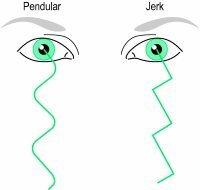 Jerking nystagmus, characterized by faster movements in one direction than in the opposite direction, is more common than pendular nystagmus, in which the oscillations are approximately equal in rate in both directions. Jerking nystagmus occurs normally when an individual observes a moving object, but on other occasions it may be a sign of barbiturate intoxication or of labyrinthine vestibular, vascular, or neurological disease. Labyrinthine vestibular nystagmus, most frequently rotary, is usually accompanied by vertigo and nausea. Vertical nystagmus is considered pathognomonic of disease of the tegmentum of the brainstem; nystagmus occurring only in the abducting eye is said to be a sign of multiple sclerosis. Seesaw nystagmus, in which one eye moves up and the other down, may be observed in bilateral hemianopia. Pendular nystagmus occurs in albinism, in various diseases of the retina and refractive media, and in miners after many years of working in darkness. In miners the eye movements are very rapid, increase on upward gaze, and are often associated with vertigo, head tremor, and photophobia. Electronystagmography, used in testing for vestibular disease and evaluating patients with vertigo, hearing loss, or tinnitus, records changes in the electrical field around the eyes. Nystagmus is measured as the person gazes at various objects and is placed in various positions and when cold or warm water or air is introduced into the external auditory canal. This final test causes nystagmus of equal intensity in normal individuals. In patients with an inner ear or neural disorder, nystagmus may be more intense, diminished, or absent. Also called nystaxis. nystagmic, adj. Ophthalmology Rapid involuntary oscillary eye movements Directions Horizontal, vertical, rotary. See Caloric nystagmus, Irritative nystagmus, Paralytic nystagmus, Recovery nystagmus, Opticokinetic nystagmus, Seesaw nystagmus. Rhythmic oscillation of the eyeballs, either pendular or jerky. Persistent, rapid, rhythmical, jerky or wobbling movement of the eyes, usually together. The movement is usually transverse and most commonly of a ‘sawtooth’ pattern with a slow movement in one direction followed by a sudden recovery jerk in the other. This kind of nystagmus is often CONGENITAL and, in this case, although associated with some reduction in visual acuity, is usually of little significance. Nystagmus may also be pendular or, when vision is very poor, of a searching type. Acquired nystagmus is always of significance as it implies an acquired disorder of the nervous system. Involuntary rhythmic oscillation of the eyeballs. n the state of oscillatory movements of an organ or part, especially the eyeballs; irregular jerking movement of the eyes. Each movement of the cycle consists of a slow component in one direction and a rapid component in the opposite direction. Q. My granddaughter has Nystagmus, diagnosed when she was about 9 month old. Is there a community for Nystagmus? We have taken her to see Paediatric Ophthalmologists in Singapore on a regular basis,since last year July. The little girl seems to be sensitive to light, especially white light. She can hardly open her eyes outside the house during day time.In the late evenings. she seems to be comfortable and can actually see things well. The eyes seem to be ok with house lightings at night. A. Not specifically for nystagmus, but there is a community about eye disorders (http://www.imedix.com/Eye_Disorder) .